﻿ Should caravans & motorhomes feature tyre pressure systems? Should new caravans & motorhomes come with tyre pressure monitoring systems? Tyre pressure monitoring systems are designed to continually monitor your caravan or motorhome’s tyres. They are also there to notify you of low and high pressure, excessive wear and overheating. Installing a tyre pressure monitor is a great way to prevent potential blowouts, improve braking distance and general wear and tear – and to instil peace of mind when driving or towing! 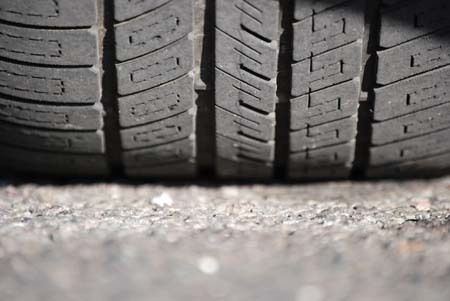 With such clear, proven benefits, it’s often questioned why tyre pressure monitoring systems such as those available from TyrePal, Tyre Sure and Steel Mate, aren’t yet fitted as standard to new caravans and motorhomes, or why the tyre pressure monitoring systems found on many new cars haven’t found their way onto motorhome base vehicles. The only caravan manufacturer we know to have come close to offering tyre pressure monitoring as standard is Bailey on its Unicorn caravan range, where sensors are fitted as standard to the caravan wheels and buyers have the option to purchase the in-car monitoring screen made by TyrePal. Do you think that new motorhomes and caravans should come with tyre pressure monitoring systems fitted as standard? Maybe you feel monitoring systems would add too much to the cost of a new motorhome, or perhaps you think any added cost would be worth it? Or maybe you’re happy to keep tabs on your tyre pressures the old fashioned way by manually checking on a regular basis. Of course a TPMS system can’t spot things like damaged sidewalls – so such systems would never completely replace the need for some regular visual tyre health checks. I do not have TPM on my motorhome, but I do have it on two family cars Bentley and VW, both different systems, but they are a good aid to safety. Bentley car system monitors pressure in each tyre and shows actual pressures on the info screen, VW monitors all four wheels and informs you of a low pressure, you have to check each tyre to find which tyre pressure is at fault. With all these systems there could be a component failure at any time? You only get what you pay for ! Simple answer is to do your routine checks as per the car user handbook, with or without the TPM system. Ensure you and your passengers ‘stay safe’. People already don’t put enough importance on ensuring their vehicle is roadworthy. Gadgets like this only serve to give poorly trained and poorly experienced drivers a false sense of security and will result in more total failures and other missed defects. You can’t replace the effectiveness of a regular walk – round, both before any big journey and at regular intervals. When visually checking you will also notice other potential issues such as lighting, bodywork etc. These gadgets will merely make it less likely for those who don’t really take enough care over the condition and roadworthyness of their vehicle to carry out any checks at all. IMHO as a professional driver, seeing so many incidents up and down Europe caused by insufficient maintenance and ignorance. Like Sat-Nav’s, it is an extra tool for an otherwise conciensious driver. It won’t turn a bad driver into a good driver. Just saying like. For approx £150 for a tyre monitor, why wouldn’t you fit one even if only for peace of mind. They should be fitted as standard as well as a spare tyre. I have just bought a new Hymer Duomobile and neither are fitted as standard. its a bit lke damp caravans no one wants to take that up either ! TPMs are not necessary. Had a blowout on M6 in pouring rain. TPM would not have helped. The caravan industry needs to have a look at the size of tyres and hence the pressure. Too many operating near max pressure stamped on tyre. Never a problem on old caravans with wider wheels. No body wants to take this issue up. Would welcome other opinions. I have TyrePal Monitors fitted to Car, Caravan, small Campervan & old sports car, been using them for the last 4 years and wouldn’t be without them. Picked up a screw in one tyre and it showed 1 psi loss over a week (seen on the system display as low in comparison to the other 3 tyre pressures). Needed to get the soapy water out to check its location as it was well & truly hidden!. Sorted FOC by my local Dexel depot. Tried to get them fitted on new Volvo XC70 purchased in Sept 2011 but not available then! Yes I do think they should be fitted from new, responsible motorists would/should not miss out on the usual checks round Car/Caravan, + keeping a record of the age of the tyres on low mileage use vehicles. all our caravans over the last 30 years have had tyres replaced due to age not wear. Initially I thought that these were a good idea and after reading some of the comments from those who have had experiences with them I think I would want the option. Until the manufacturers can make them more reliable I will continue with a manual check before setting off. I am not convinced, as the danger will be neglecting actually looking at your vehicle’s tyres at all, until some warning of a pressure problem alerts you. Some time ago a screw on valve cap was under development for motorcycles where you would preset the correct pressue in (psi) into the cap, and the cap end when set turned green, at a manufacturers preset variation, from the correct set pressure the cap end would change colour to red (about a 10% variation). The advantage being you would get into a routine, of looking at the valves to check their colour, and automatically be looking at your tyres at the same time, so a regular pressure and tyre condition check. I’ve had Tyrepal sensors on my Motorhome for a number of years.As They never seemed to work properly and it was a bit of a pain to change batteries (on monitors and sensors) I gave up on them.they may be better now,but can’t comment.That said I’ve just bought a Snooper sat nav together with Tyre Pilot tyre sensors. (they look suspiciously like the Tyre Pal ones! )Only time will tell if this system is any better,but I do like the fact it only takes 4 batteries, but the monitor seems pretty clear. Thanks for your feedback D Burdon! As a retired police officer I have seen firsthand how important tyre pressures are.However tyre pressure monitors are not the answer. People should assume the responsibility for checking pressures themselves,especially with motor homes.I have travelled 80000 MLS abroad,over 10 yrs and check my motor home tyre pressures every time I move off.You need a good quality tyre guage and good quality equipment to inflate your tyres.The only time I have had problems with tyres going down is with faulty sensors on the tyre valve,which actually let the tyre down.I was then charged 300euros for new Michelin tyre and there was nothing wrong with my own tyre.Tyre monitors are not the answer to tyre pressures,sensors can be faulty,people would get lazy and rely on them working properly,there is no substitute for checking them yourself.Tyre pressures on motor homes and caravans are paramount and should not be neglected. Relying on expensive tyre monitors is no substitute for a good quality tyre gauge. Tyre pressure monitors should be included in the standard specification of all new vehicles irrespective of their use. The cost of the monitor compared to the cost of the base vehicle is so small it would make no difference but with real safety benefits. I have Jeep Cherokee fitted with Tpms and they are a pain. They are fragile and if the plastic dust cap has been tightened too tight as mine were when I purchased the vehicle they break off. They cost £90 each plus fitting. If the tyre deflates rapidly, no amout of warning is of any use but admit slow deflation will be picked up but so will driver awareness be helpful. yes there is a debate but having used them for years on compant cars, inthink they can be a pain giving false info when things ate ok, just check thres before you go ! my last comment as this could go on for years lol! I have fitted sensors to my car and twin axle caravan, and it has proved invaluable, and I would say that it is well worth fitting. I can set the pressure warning signal between my pressure range before it activates. Also, if I turn it on while traveling, it will not register until I stop and start again.So this is just another thing to remember before I set off. 1/ The sensor locking screw. The thread is a bit fragile, so do not over tighten it. 2/ The sensor has to be removed to inflate the tyre. I am debating if it is o.k. to fit a second tyre valve and fit the sensor to it. There does appear to be an argument for an against tyre pressure monitoring systems so far! People must realise that all these gadgets including sat navs are just an aid and are no more than that. The tyre pressure monitor is as it says, it monitors the pressures while you are on the move, It is still the full responsibility of the owner to make sure that everything is in order before they move off. The regular check of tyre pressures is essential and a good way of making sure you also check tyre damage. I use this time to do a good viewing of the lower parts of my caravan. As regarding tyre pressure monitors (TPM) Yes to TPMs on motor homes but no to caravans , reasons being that if TPM was fitted to caravans then in my view it would stop the vehicle driver of doing his/her regular routine inspection of checking the tyres for heat , bulges , and damage and whilst doing this glancing at each securing wheel bolt/nut . This check is always done by 90%+ of vehicle drivers any time they stop for a break or when reaching their destination . High tyre heat indicates some problem to make further checks , naturally any damage is to get the tyres repaired/renewed . The wheel bolts/nuts means problems , but if torqued correctly then should be back to safe order . If the driver didn’t walk around their outfit then many other items would/could not be visually checked ie – road lights , windows closed securely , any damage spillages and structural faults .As well as glancing inside the caravan ensuring the contents are in order and nothing has moved . Thank you . I have ture pressure moitors on my Mazda CX5 they are a real problem going off if the pressure alter slightly, warm weather, hot sun when it has been stood and yes as soon as you set off with the caravan in tow, so you have to pull-up just to check there isnt a serious problem ! New caravans should definitely have tyre pressure monitor/warning systems fitted as standard – not an option.